So my actual start was probably winning a CVS Pharmacy writing contest sometime in the early 80s ($5! A veritable fortune! 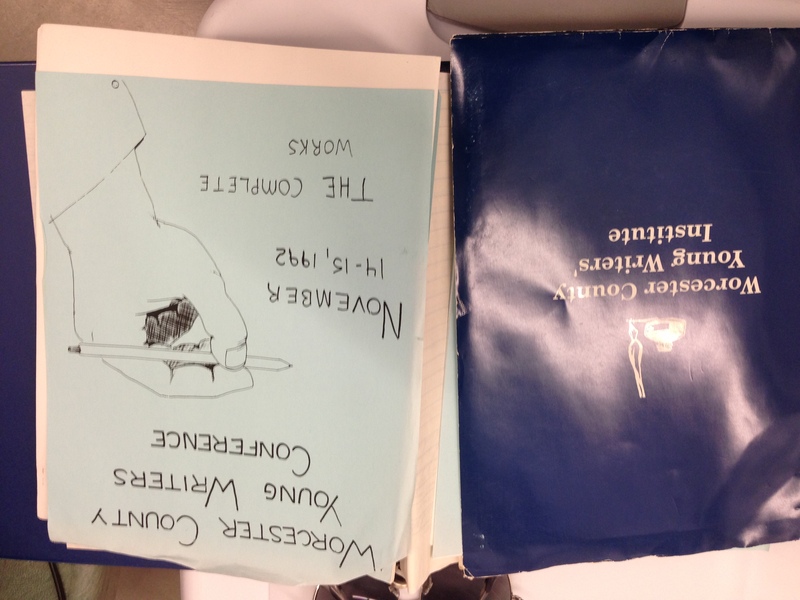 ), but my second start to my writing career was the Worcester County Young Writers’ Conference, held at Saint John’s High School, and still held there, every year since 1989. Samuel Pickering, who was the inspiration for Robin Williams’ character in Dead Poets Society, was the guest speaker, and they had published writers on-hand to discuss writing with us youngsters from all over the Worcester County area. I saw something about the conference the other day in the Saint John’s Alumni magazine, and dug out my old binder from the 1992 one. I can’t tell you how fortunate I was to have gone. Until that point the role models I had had were policemen — my family was peopled by a chief of police of Worcester, state troopers, Worcester policemen — the author of my life very unimaginative when it came to occupations. Or athletes from the Boston professional sports teams, which I followed with the obsession of a young boy obsessing about something. My plan, to that point, was to get drafted by the Red Sox or Bruins, despite the fact that my hockey skills are somewhat… lacking and my baseball skills weren’t exactly setting the world on fire. So I traded one set of delusions for another set*. It’s an excellent environment for a young person to experience people preoccupied with the writing life, all the process, pitfalls, and sheer joy of reading and telling stories. It’s a real gift for misguided young people who want to be encouraged to keep up their delusions. * To be honest, I’m still waiting for the Red Sox to call, I’ve got a year or two left in my arm, if I start throwing a knuckleball. And if the Bruins need a forward for tonight’s Game 6 against the Chicago Blackhawks I have left a message on Peter Chiarelli’s voicemail to let him know I’m available. I just need airfare and a lift to the Garden. Carl Hiaasen vs. Christopher Moore, Fight!